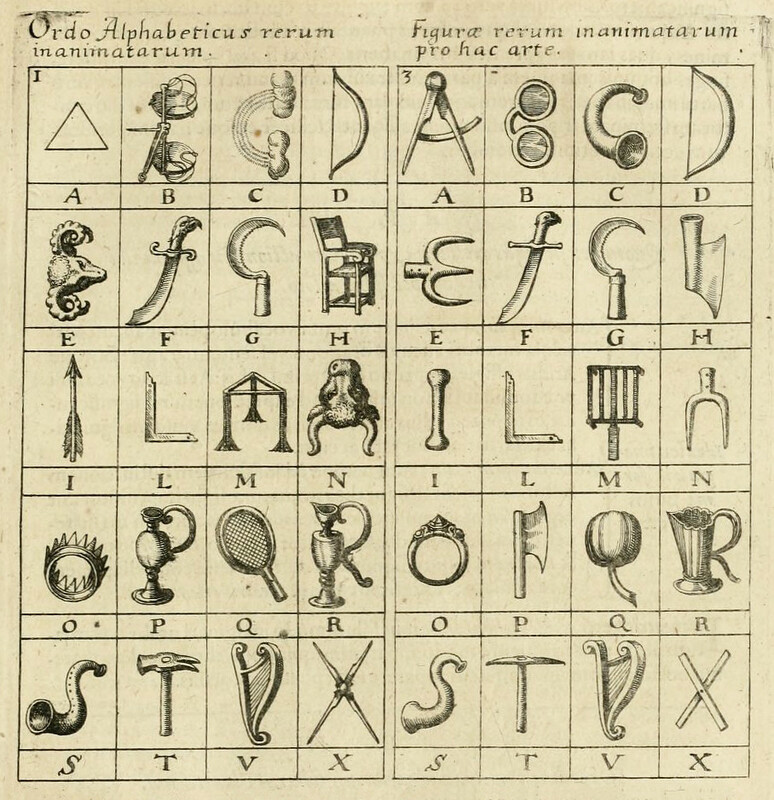 Inspired by the mnemonic alphabet featured in Jacobus Publicius’ pioneering 1482 book on improving memory, the great English polymath Robert Fludd came up with his own system of correspondences, where each letter or number is paired with an object which echoes its shape. The idea was that a string of letters or numbers could be recalled by the picturing of a scene involving objects. So the date 1066 could become a speared donkey lagging behind two snails; the acronym PDR, a crazed axe-wielding editor chopping up a bow and then placing the bits into a jug. 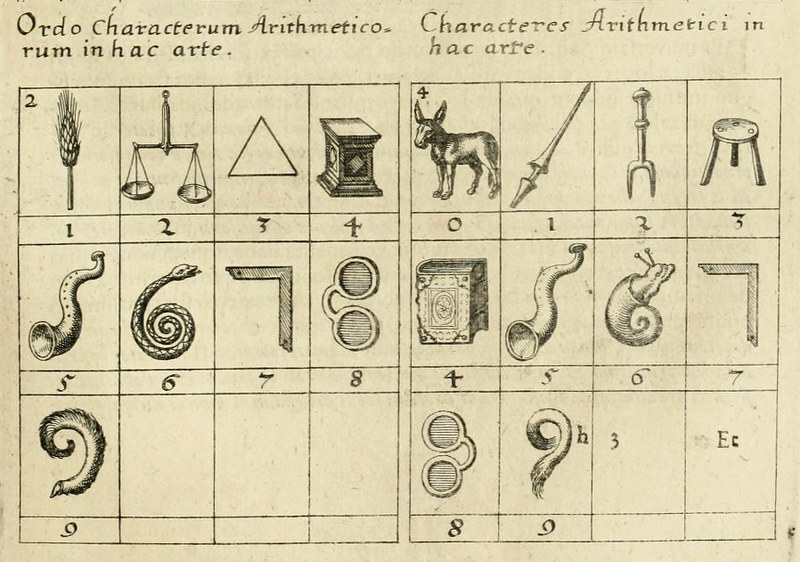 Both the mnemonic alphabet and the numbers feature in Fludd‘s masterwork Utriusque Cosmi … Historia, first published between 1617 and 1621. 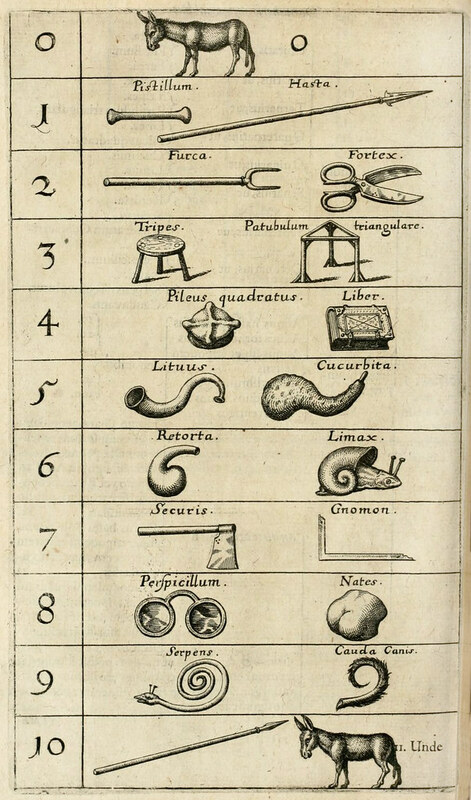 These alphabetical and numerical tables seem to be the simplest elements in a very complex mnemonic system Fludd developed, largely based around the memorising of complex musical structures. If you are wondering why a donkey is used to signify zero, Fludd helpfully provides an explanation, the “zero signifies a donkey, because (as they say) the donkey is of no use”. For more on Robert Fludd read Urszula Szulakowska’s essay “Robert Fludd and His Images of The Divine”. Download: Right click on images or see source or higher res versions.